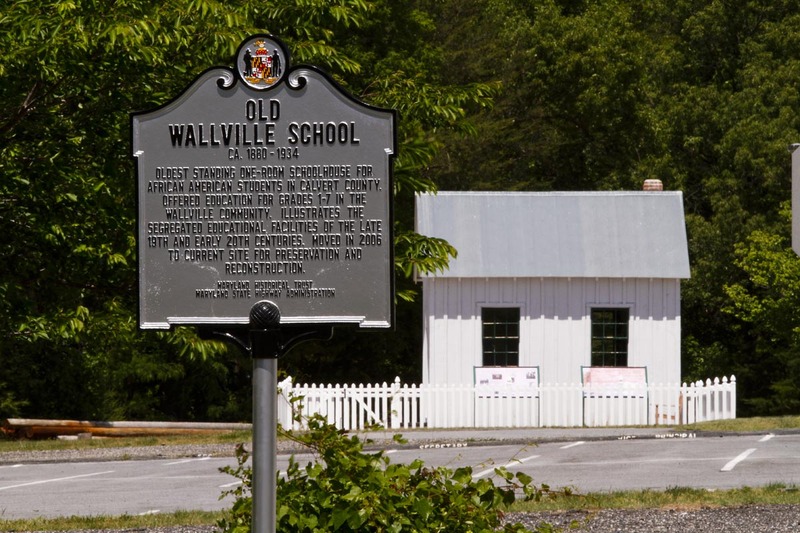 Rescued from imminent demise, the Old Wallville School was relocated to Calvert County Public Schools property and reconstructed. Whever possible, salvageable portions of the original wood frame 18′ x 18′ structure were retained. Interior furnishings reflect its appearance in the 1930s. The facility is the oldest standing one-room schoolhouse for African American students in Calvert County and offered education for grades one through seven in the Wallville community. The schoolhouse was built by the early 1880s (with some evidence suggesting an early date of 1869) and remained in use until 1934. Faced with a student body averaging between 35 and 45 students, the teacher often placed three small children at each desk and assigned others to sit in the aisles. Books and other materials were second-hand and often outdated, but did serve to educate thousands of African American children in the county.